Last year, the Center for Food Integrity (CFI), a non-profit working to facilitate public confidence in the US food system, conducted a consumer survey. The survey focused on a few key groups –mothers, foodies, and millennials –and aimed to examine ‘messenger trust’ related to issues like GM safety. Before any topical information about GM foods was given to respondents, the report indicates that mothers placed greater trust in scientists who were also mothers than they did in government scientists –presumably because of the perceived overlap in the shared values and experiences of motherhood. Surprisingly, at this early stage they also trusted their lay peers over the government scientists. 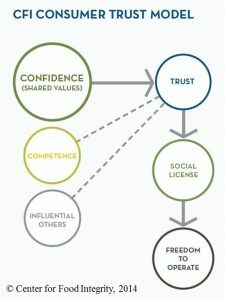 Once each messenger group had delivered a relevant argument expressing a shared set of values and ethics with consumers, however, the trust scores of government scientists improved and surpassed scores of the peer group as one might expect. 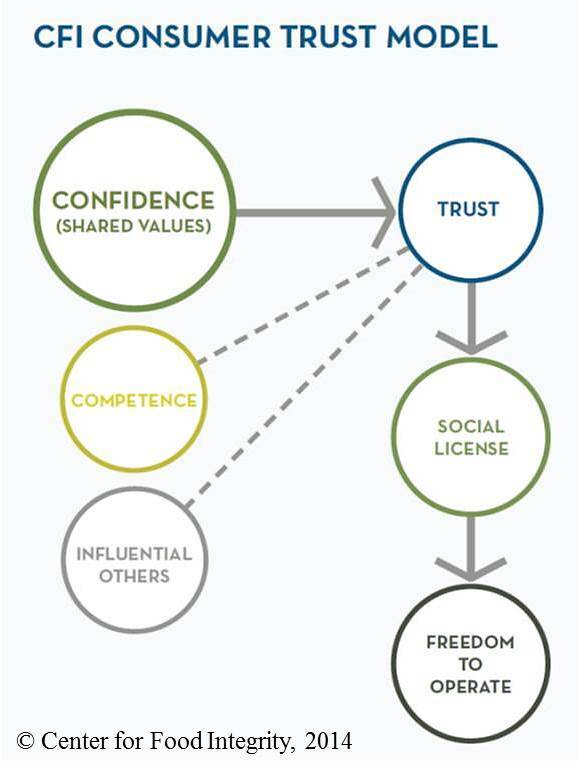 The results suggest that while shared values are initially the most important criteria for consumer trust, one’s technical expertise and competence enhances consumer trust after that –maybe even giving a well-spoken scientist the persuasive edge, for example, over someone with only shared values to argue (i.e. 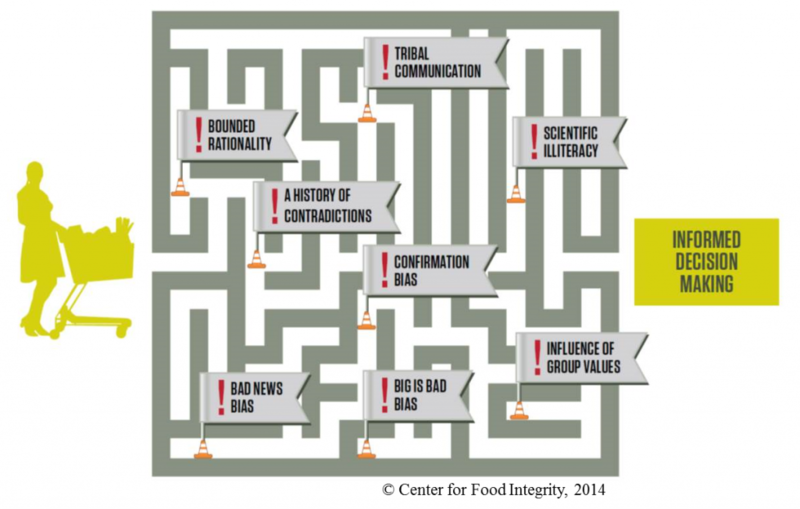 people like the Food Babe and Jenny McCarthy). More and more, today’s major outreach obstacles in the plant sciences seem to lie not in information dispersal but in where the public is willing to place its trust. Facts are now only one component of the American public’s decision-making process, with social and political factors tipping the balance. During his presentation at the recent Plant Biology 2015 meeting in Minneapolis, the CFI’s JJ Jones implied that the public’s distrust of the government and other larger-than-life organizations (like today’s ‘Big Food’ and agricultural giants) can be traced all the way back to the political turmoil of the late 1960s, an era whose violent events eroded a nation’s optimism for the future. If this is true, then more recently it can be linked to the unethical behaviors of massive corporations, whose misdeeds have had tangible economic consequences for Americans. And it can also be argued that the public’s negative perception of science likely has roots in the history of the field itself –in the tragically overlooked risks of DDT and thalidomide; in the ethical failure of Tuskegee and the emergence of eugenics; in the still ongoing sexism, racism and classism restricting entry to the field– where the biggest mistakes have repeatedly wronged marginalized groups of our society. These are the same groups which, by current political climate, continue to be marginalized in many other ways beyond the realm of science –the consequence of which is often a wider culture of self-protective skepticism and the easy reinforcement of beliefs within tight, like-minded communities. Consider, for a moment, that some of the most prominent opponents to GM foods (and vaccines) are women with young children, and that many of those receive their most trusted information from other women and mothers on widely popular ‘Mom Blogs’. This is all to suggest that the motivations for consumer objections to scientifically-validated ideas are anything but one-dimensional, and that realistically they require an approach more complex than a simple barrage of facts. People can be misled towards social and political biases –but the good news is that they also can be persuaded with better access to information, delivered in a way that connects to (rather than dismisses) their values. The tough news? They will not be persuaded without empathy and honesty, or with unmediated fact alone, and that’s a harder skill to learn on the part of science communicators. But really, the public has always deserved the most compassionate and accurate communication from us. We need to find more ways to provide it. The second part of this post will explore storytelling as an entry point into the task of responsible, scientifically accurate, value-based communication. Check back next week for that. Until then, have a look at the CFI report if you’re interested, or share below your experiences with communication and outreach on contentious topics.